I was all set to view We Are What We Are when I realised that I was watching the wrong film. Turns out I was about to watch the US remake of the Mexican original. The film starts with a death. A man dies in the street. He is the father of a family that possesses a terrible secret. They are cannibals who relied on their father to bring them their victims. Now that he is dead, this role falls to the oldest child of the family - Alfredo. Unsurprisingly, Alfredo is none to keep to assume this role. His reluctance, however, creates a power vacuum that leads his mother, sister and brother to take matters into their own hands - with truly horrific consequences. If it hadn’t been for my film challenge, I would never have ended up watching a Mexican horror film about cannibals. But that is the whole point really. It wouldn’t be a challenge if I got to watch Disney movies all day would it?! 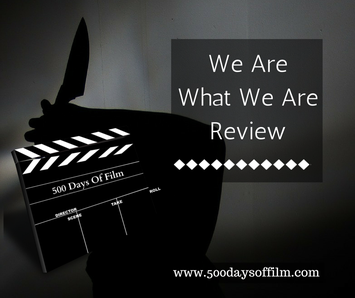 We Are What We Are slowly builds its characters and takes time to create an unsettling amount of tension. You do care about the three children and Alfredo in particular. He doesn’t want to become like his father but feels trapped as, without human meat, they believe they will all die. So along the film goes… slowly, strangely, slowly, then something quite shocking happens and then it is all rather gross. I have to report that I wasn’t really scared at any point - just a bit grossed out. The gruesome stuff is more implied than shown but that is sometimes worse don’t you think? While watching this film I questioned if I was enjoying it or if I would recommend it to anyone. However, by the end I was truly gripped. And what an ending it was. Still not sure what’s with all of those clocks. The sound effects of this film are as disturbing as any of the visuals.. perhaps more so.